An organization funded by George Soros, a proponent of net neutrality, attempted to buy its way into negotiations that would impact Internet regulation, a leaked document shows. With net regulation as its main concern, the leftist billionaire’s Open Society Foundations funneled $66,290 to a nonprofit with the goal of influencing the positions of Latin American governments in negotiating the Transpacific Partnership Agreement (TTP). The leaked document reveals the Soros organization under the project title “Promotion of Human Rights Standards in Latin American Internet Regulation” provided the funds in 2013 to ONG Derechos Digitales, a nonprofit based in Chile focused on public interest and technology. “Advocate for the protection of human rights standards in the Transpacific Partnership Agreement (TPPA): provide technical assistance to negotiators of Latin American countries (Chile, Peru, and Mexico) of the TPPA; raise awareness about the TPPA in the Spanish-speaking countries. According to a Breitbart report, the Inter-American Convention on Human Rights is pushing for a system of “universal human rights and rules, and it tasks governments with altering their own domestic laws to align with those of the Convention, including rules pertaining to property rights and the judicial system.” Twenty-three Central and South American countries are currently members. White House spokesman Josh Earnest told reporters Obama would push for the TPP to be passed before he leaves office in January. Earnest said the president would make the case for the treaty during a speech in Laos on Sept. 6. “The president is going to make a strong case that we have made progress and there is a path for us to get this done before the president leaves office,” Earnest said. Soros has expressed “tepid” support for the TPP. Writing last year in the New York Review of Books, the billionaire called the TPP “an excellent opportunity for a two-pronged strategy” to forge a partnership with China if the treaty could be amended not to exclude China. 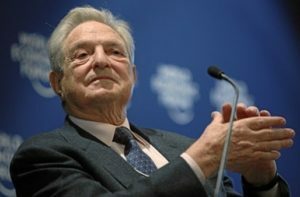 Soros opposed Obama’s request to fast-track the TPP past Congress, instead advocating for the treaty to be altered to help forge a strategic partnership with China.